Le Toy Van is calling all mini baristas! Here’s a toy combining three of my great loves – my coffee machine, wooden toys and my favourite wooden play-set creator, UK’s Le Toy Van! 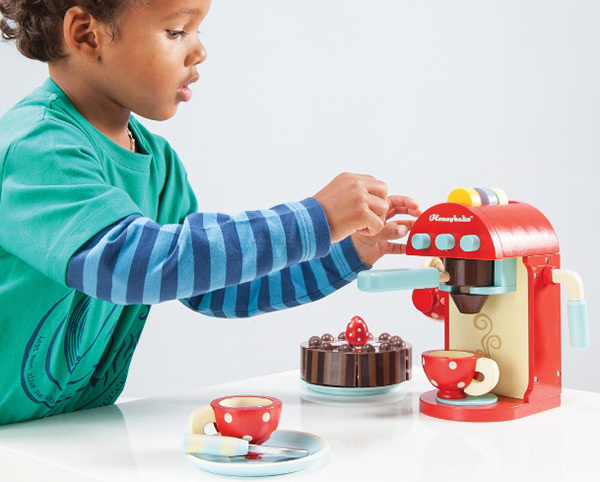 A fantastic addition to be perched on any play kitchen bench (and just like mum and dad’s), the Chococcino Machine from Le Toy Van will ignite young imaginations in an instant. 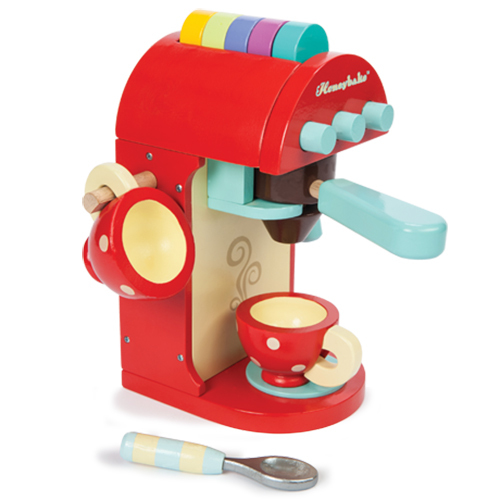 The Chococcino machine is made from wood and beautifully painted to complement the existing Le Toy Van Honeybake range of gorgeous toys. Children from as young as three can practice their barista skills using the colourful pods that are neatly nestled on top of the machine and fit into the removable filter. Two darling spotty cups and spoons are included, perfect for a imaginary hot chocolate date for two. I foresee many afternoons being whiled away acting out cafe scenes, so be prepared to be a thirsty customer and drink a lot of cups of imaginary hot chocolate! The Le Toy Van Chococcino machine is priced $49.95 and available locally from Lime Tree Kids.